Heat a stock pot over medium high heat and add oil and pancetta. Brown the pancetta bits lightly, and add herb stems, bay leaf, chopped vegetables, and garlic. Season with salt and pepper. Add the beans, tomato sauce, water, and stock to pot and raise heat to high. Bring soup to a rapid boil and add the pasta. 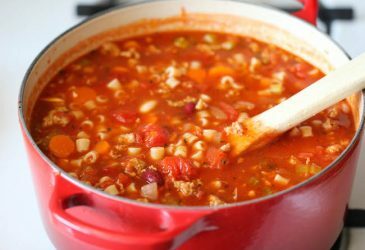 Reduce heat to medium and cook soup, stirring occasionally, 6 to 8 minutes or until pasta is cooked al dente. The rosemary and thyme leaves will separate from stems as soup cooks—just remove the stems and bay leaf from soup after turning oﬀ heat. Let soup rest and begin to cool for a few minutes. Serve in deep soup bowls with cheese on top.